In May this year, the Guide Hachette wine guide released a dedicated rosé edition. The inaugural Guide Hachette des Rosés presents its finest selection of rosé wines, chosen from 4,000 wines tasted. 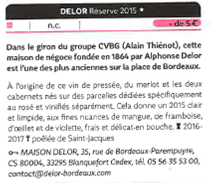 And ranked among the finest, Delor Réserve Bordeaux rosé 2015 has been awarded the coveted star rating.